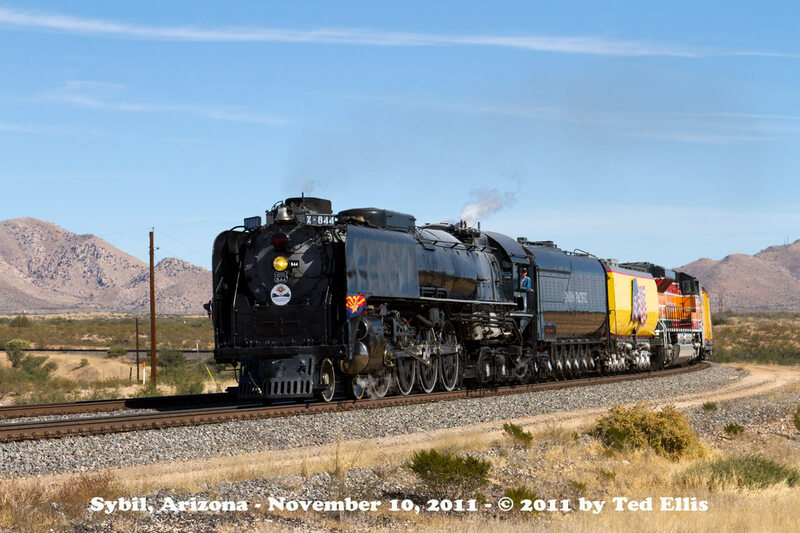 Union Pacific 844 Steam Special! 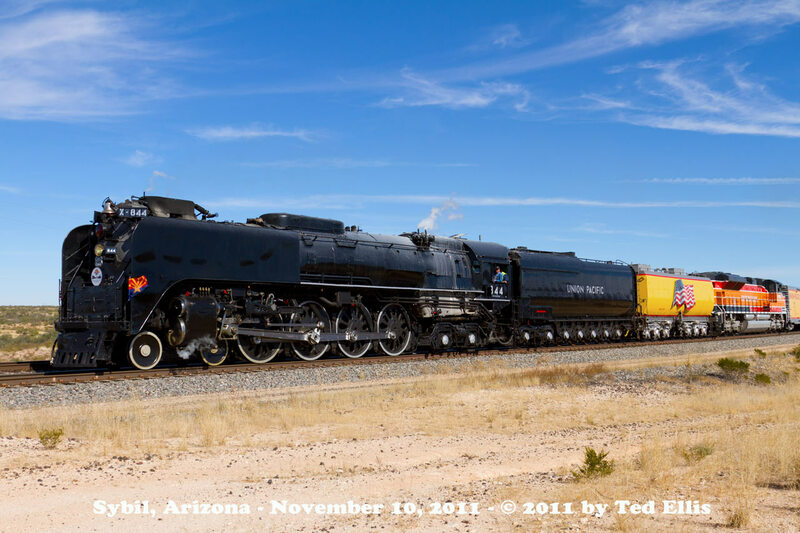 Here are my photos of the recent UP 844 Steam Special that traveled across Arizona in November 2011 in celebration of Arizona's (and New Mexico's) 100th anniversary of statehood. Even though the 100th anniversary isn't until February 2012, it was still a great thing to see. 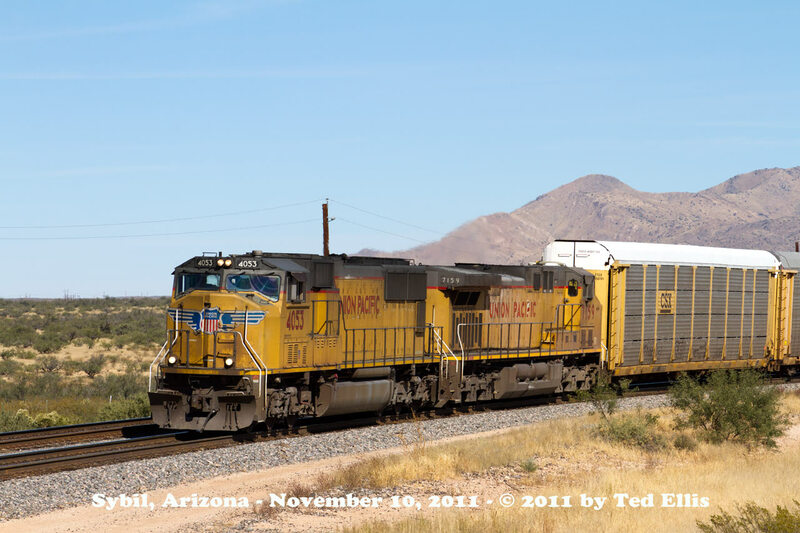 This is also my first railfan trip with my new Digital Camera! After shooting film (first Kodachrome and then Provia 100F) for 52 years (yes!) I decided to give the digital method a try. I got a Canon EOS 7D and a 24-105mm f 4 L Series zoom lens (about 37-165 in 35mm terms) for a good price. All of the photos shown here were taken with that lens and with the ISO settings at 100 to 200 ASA depending on the lighting, with the shutter set at 1/640 second and the aperture on auto. White balance was set to fixed daylight. While I have crossed over to the Dark Side (!) I have not given up on film completely. I also have a Canon EOS 1vHS, which was Canon's last and best film camera. It is very much like the Canon EOS 1D in looks and operation, and uses the same lenses as the 7D. However, my old Canon FD equipment is being retired and the good stuff will be sold soon. Out of 5 A-1 cameras I own, only one of them still works. Being that those cameras are well over 30 years old and have seen a lot of heavy use with the high speed motor drives, I decided not to spend any more money on them and rather get newer and better equipment. Updated: I have now sold off all of my film equipment and bought another Canon 7D camera and a long zoom lens. I guess I just like the ease of digital and how easy it is to make multi-media slide shows. This is the logo on the 844's smokebox. 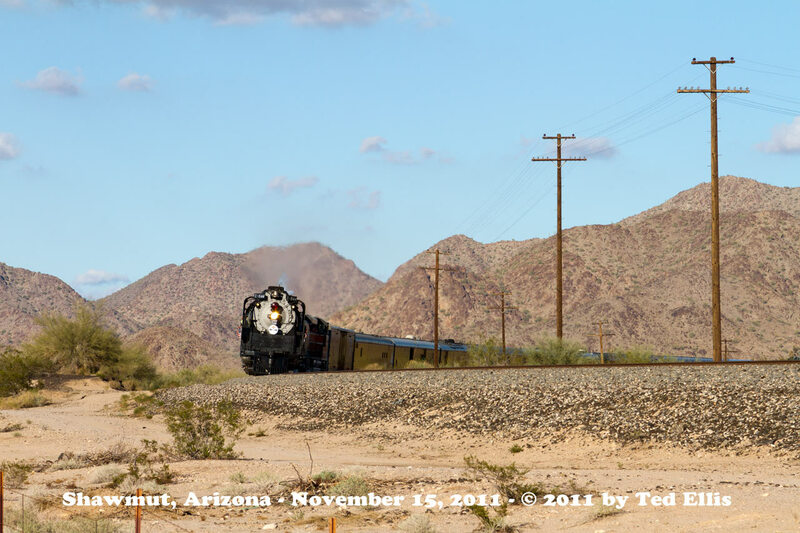 Phoenix AZ - November 14, 2011. The first place I went to for the start of the chase was at Sybil, Arizona which is a few miles east of Benson. 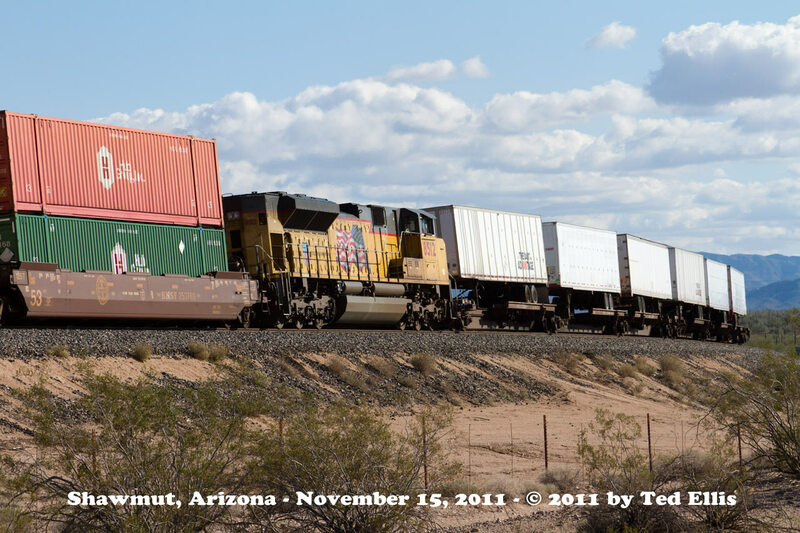 The UP was busy as usual, and here is the first of 2 freights I got while waiting for the 844. Sybil AZ - November 10, 2011. Same as above pulled back on the zoom. Sybil AZ - November 10, 2011. This eastbound was coming up the hill from Benson at about the same time as the 844 was headed west. Of course I was thinking that this train would be blocking the 844, but I was wrong! 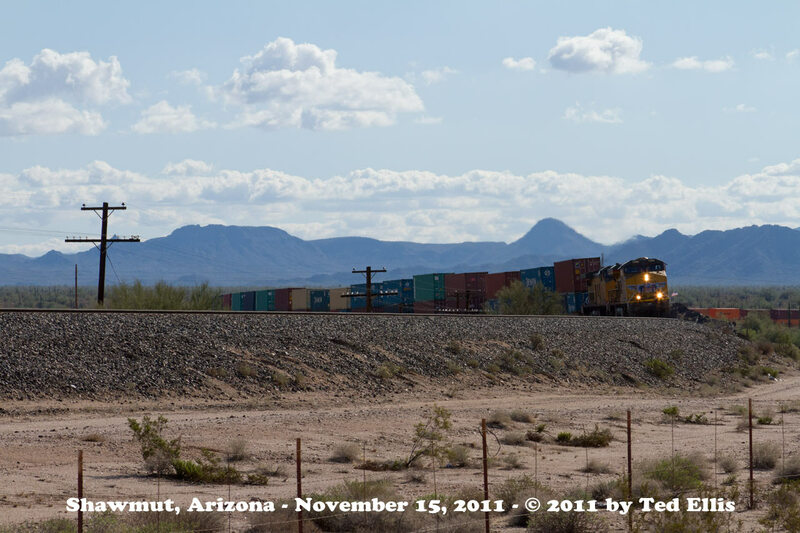 I didn't notice at the time I shot this photo, but he was on the north track, leaving the south track clear for 844. Sybil AZ - November 10, 2011. Interesting how they put the DPU power ahead of the lightweight piggyback cars - it is extra work and time to do so, but this is a good train handling procedure. Sybil AZ - November 10, 2011. And here she comes! 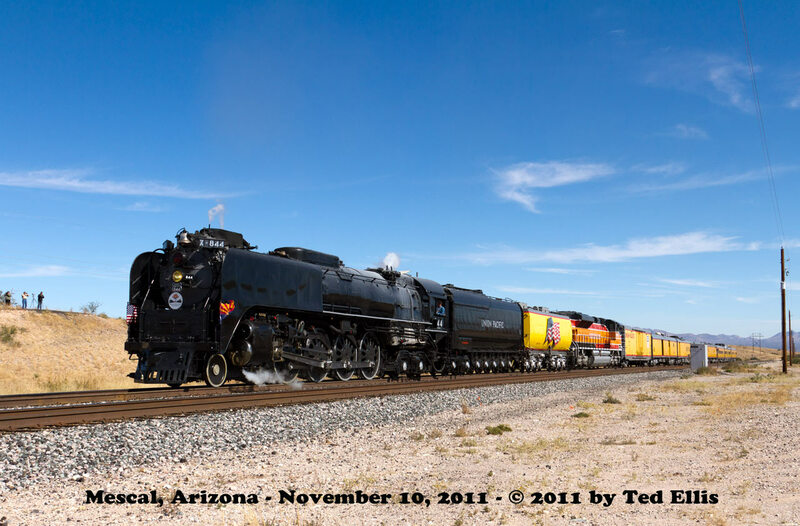 The 844 is making very good time as she heads west. Note the helicopter shadowing the train - at least they pulled up enough to prevent stirring up dust, but the sound was still obnoxious in my video. Sybil AZ - November 10, 2011. Another advantage of digital photography is that unwanted objects can be removed from the photo, as in the helicopter mentioned above! Sybil AZ - November 10, 2011. 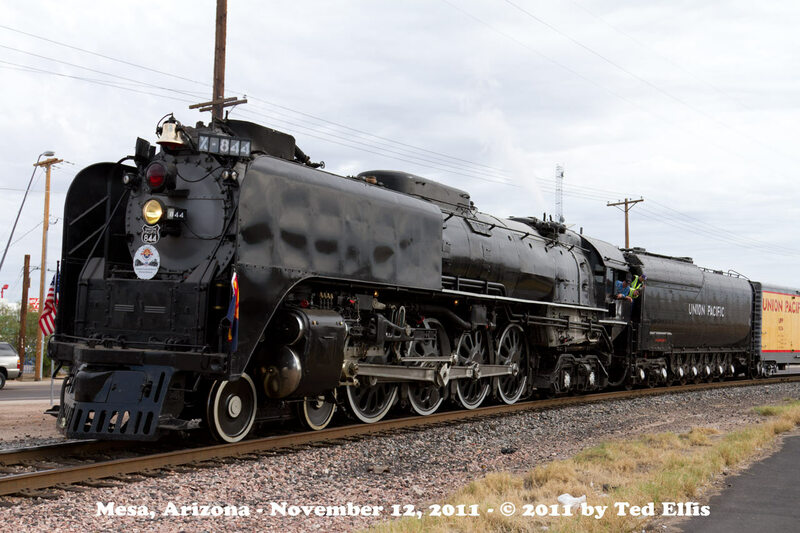 The 844 in all her glory as she passes by. Sybil AZ - November 10, 2011. Pulled back on the zoom. Sybil AZ - November 10, 2011. Headed towards Benson, AZ. Sybil AZ - November 10, 2011. 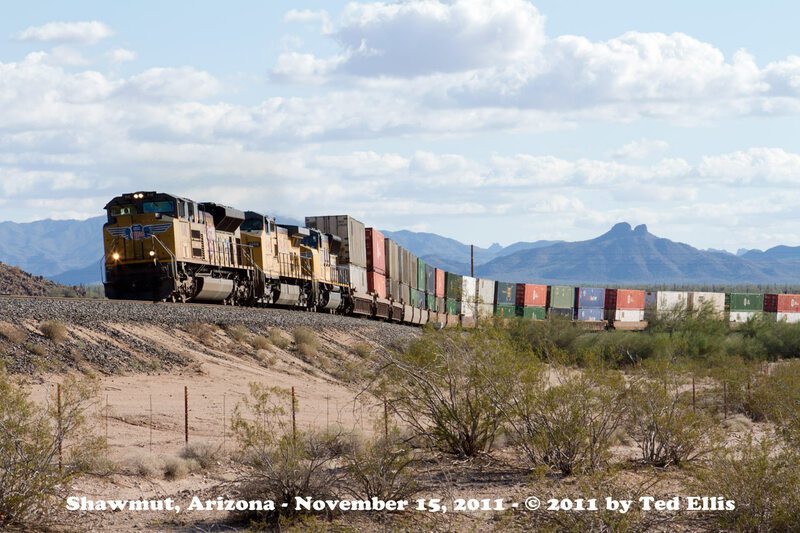 As I was getting ready to leave, this westbound came along, only a few minutes behind the 844. Sybil AZ - November 10, 2011. 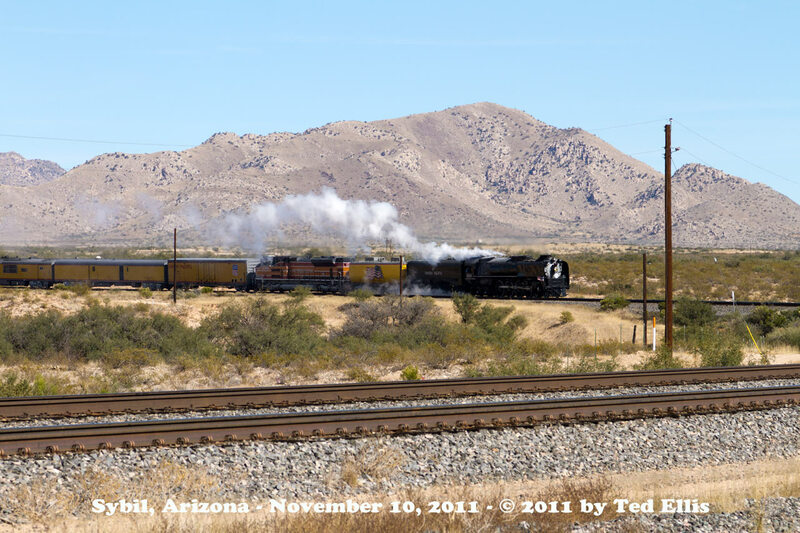 We then beat the train to Mescal, just east of Tucson. 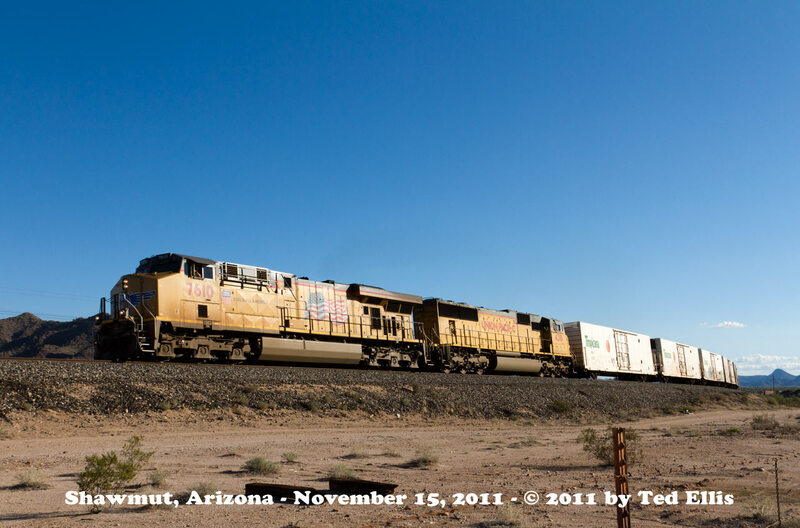 Mescal AZ - November 10, 2011. Again pulled back on the zoom at Mescal. 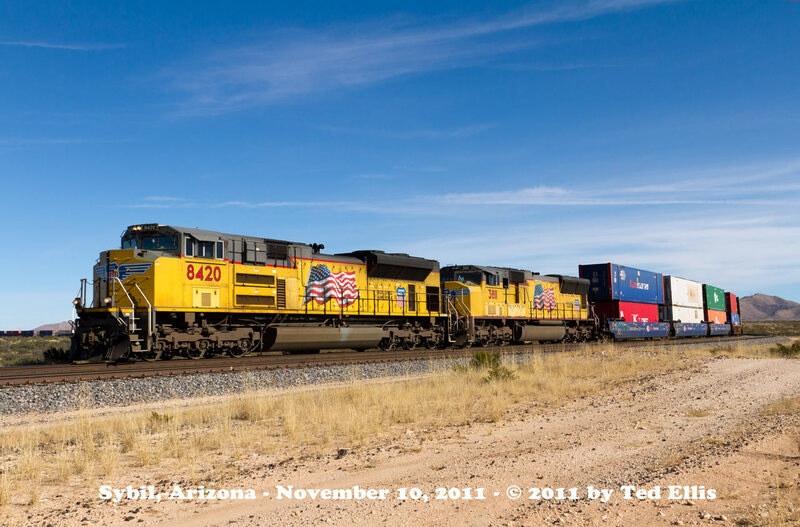 Mescal AZ - November 10, 2011. 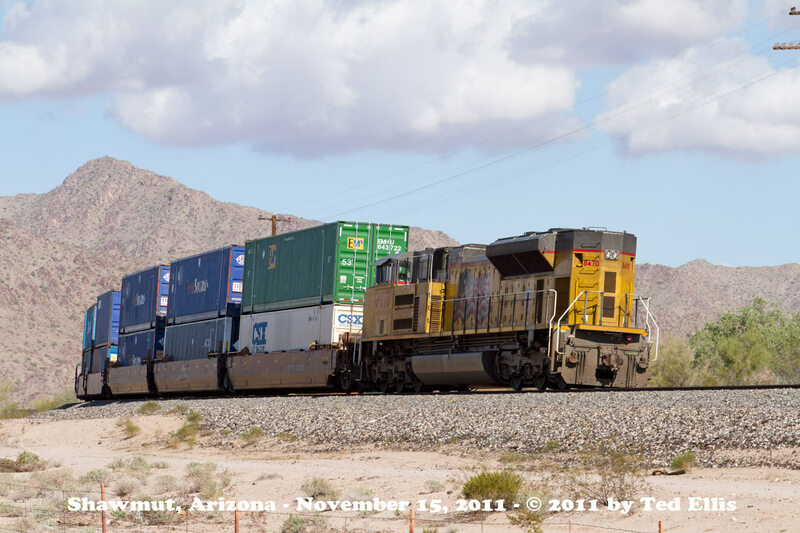 Then ahead to Vail which is in the Tucson Metro area right at the Vail Crossovers, Milepost 1000. 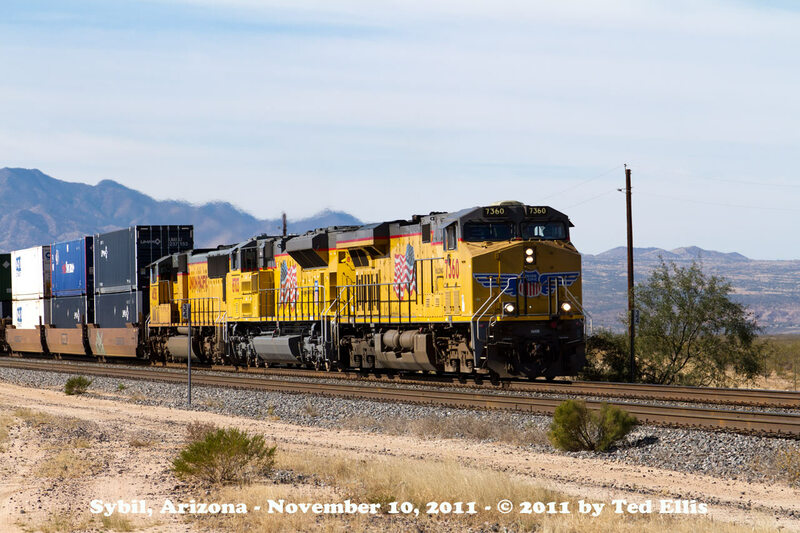 Vail AZ - November 10, 2011. Pulled back on the zoom. 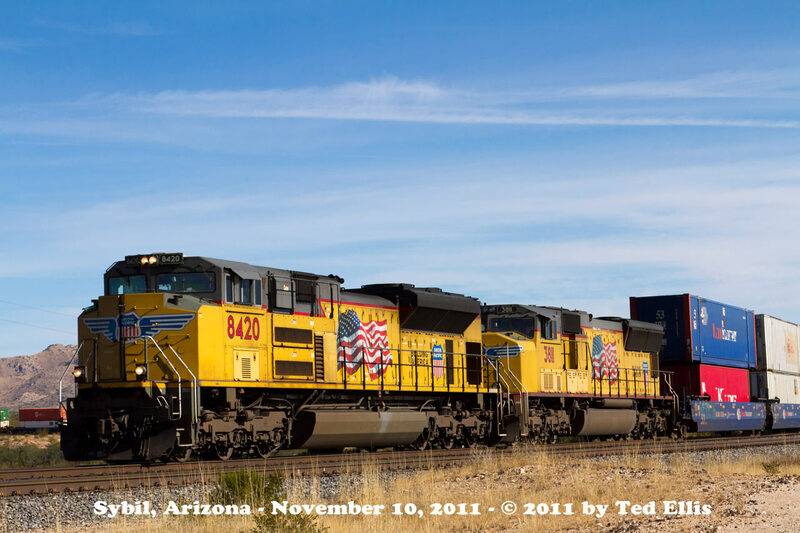 Vail AZ - November 10, 2011. 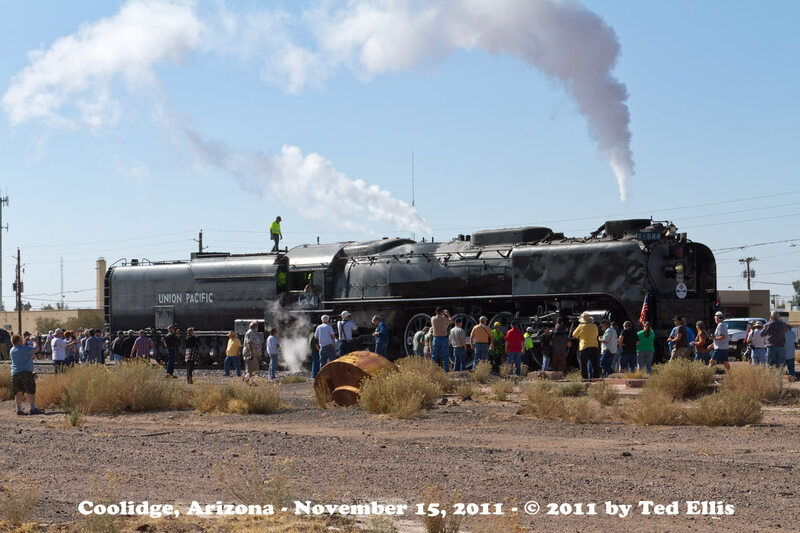 Seeing as how the steam train was going to stay in Tucson for a day and not wanting to deal with crowds of people at the display there, we started for home. 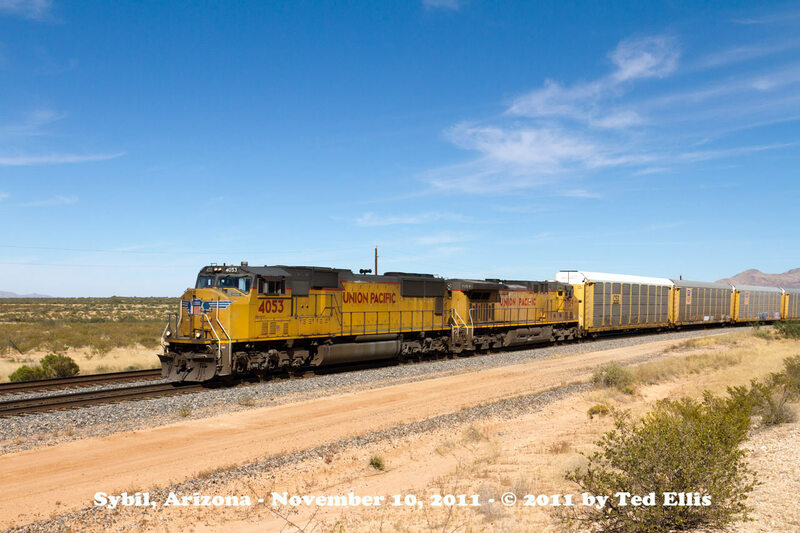 On the way to Red Rock we found this ballast train in the siding at Naviska waiting on a fleet of eastbounds. Naviska AZ - November 10, 2011. Here at Red Rock we got 3 eastbounds in quick sucession. Even though the weather was getting cloudy and darker, with the digital images I could use Photoshop to enhance the colors and contrast. 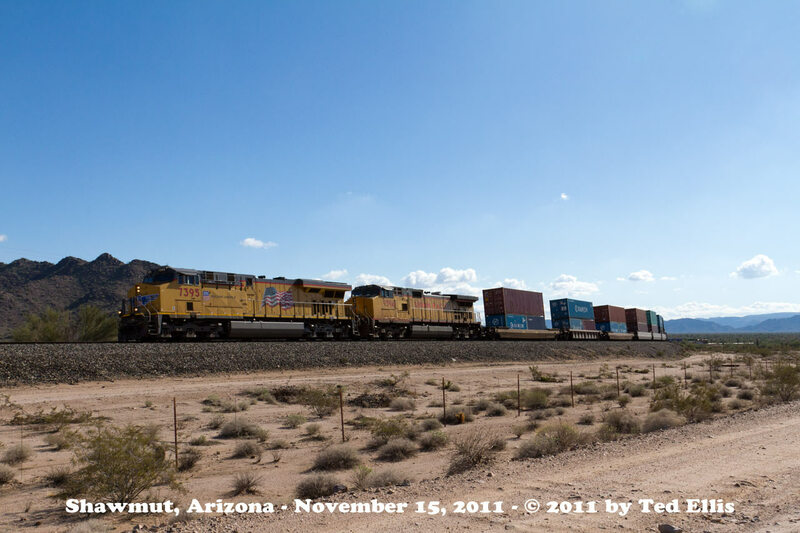 Red Rock AZ - November 10, 2011. The old water tank is still there, but for how much longer I wonder. 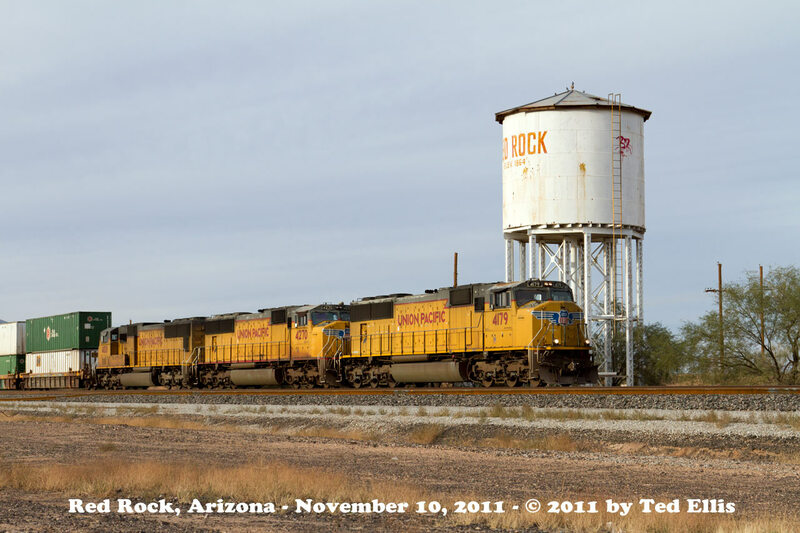 Red Rock AZ - November 10, 2011. And bringing up the rear was this clean DPU unit. 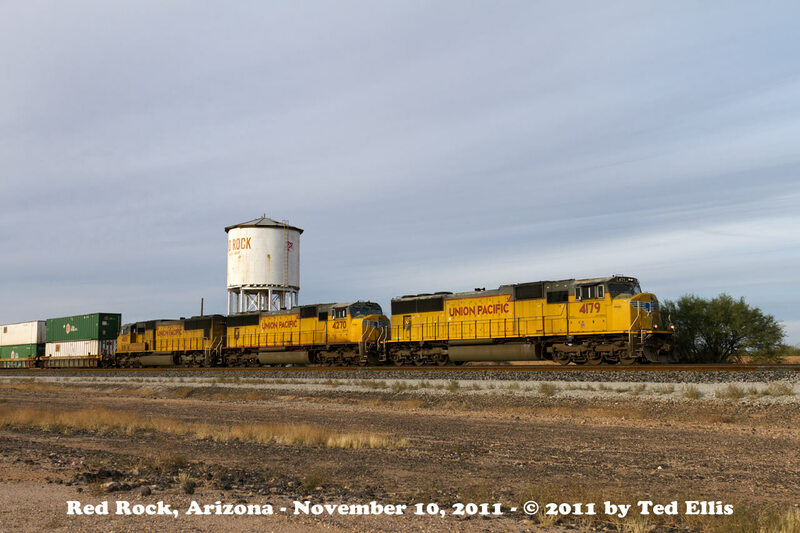 Red Rock AZ - November 10, 2011. Right behind him was this east bound. 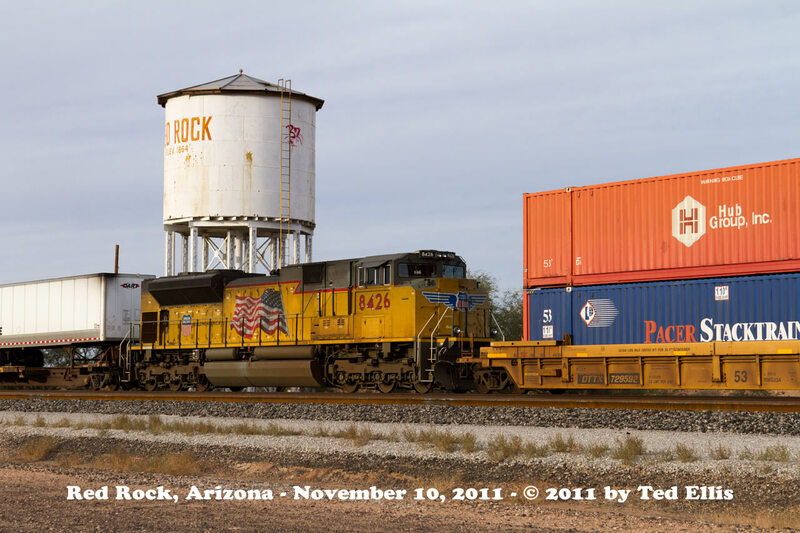 Red Rock AZ - November 10, 2011. Pulled back on the zoom. 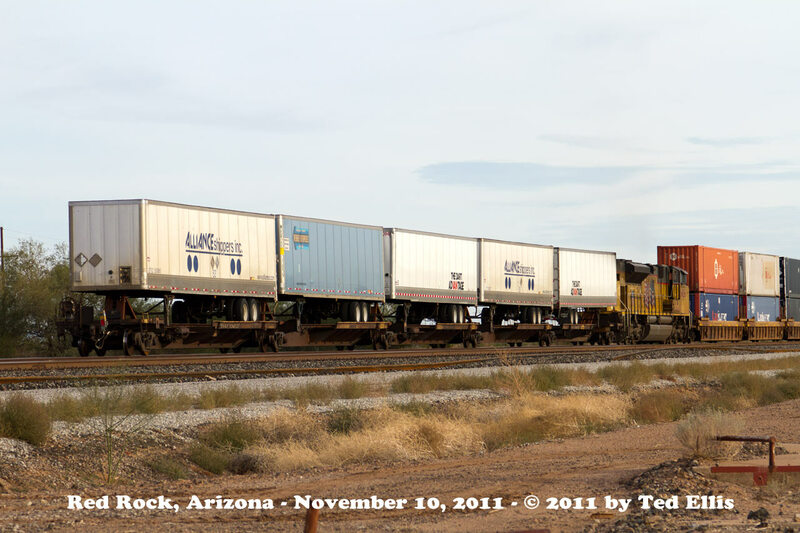 Red Rock AZ - November 10, 2011. And right behind that train was the 3rd eastbound that the ballast train at Naviska was waiting on. 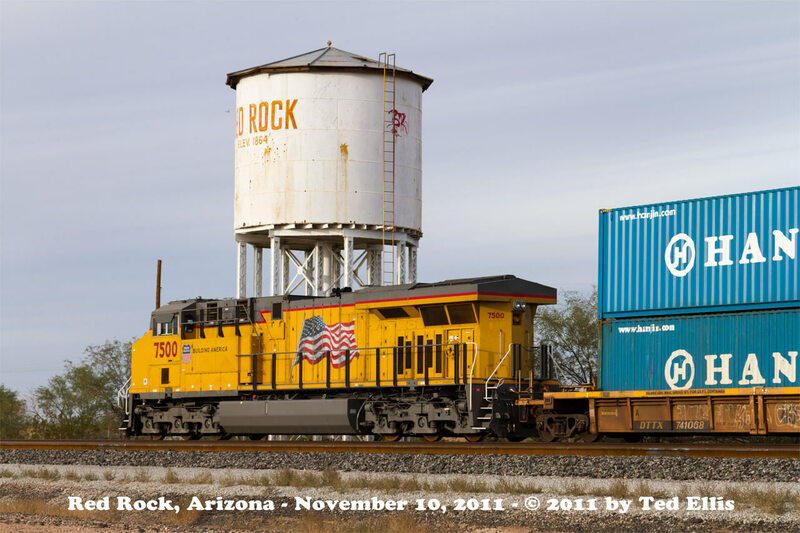 Red Rock AZ - November 10, 2011. The water tank makes for an interesting backdrop. 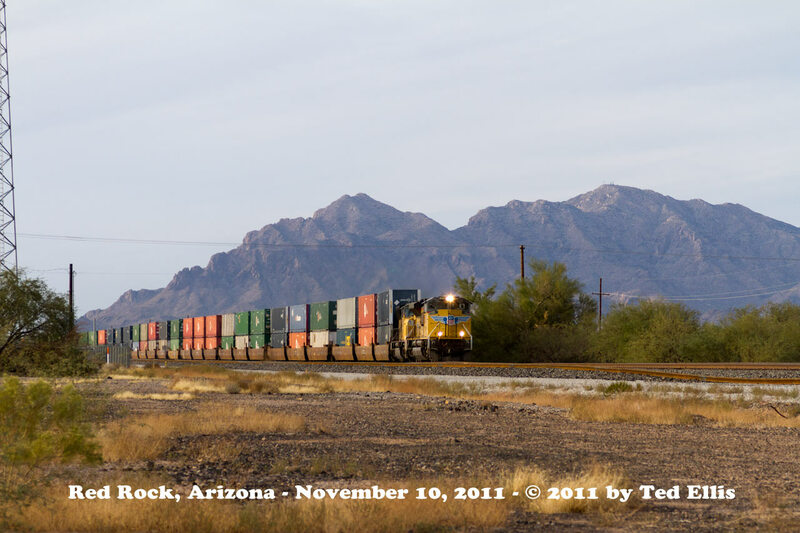 Red Rock AZ - November 10, 2011. Here is another DPU cut in ahead of the piggyback cars. 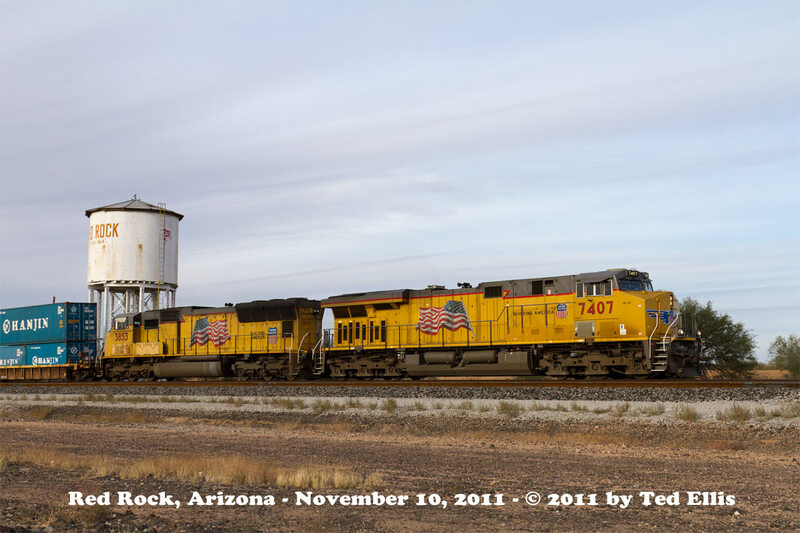 Red Rock AZ - November 10, 2011. 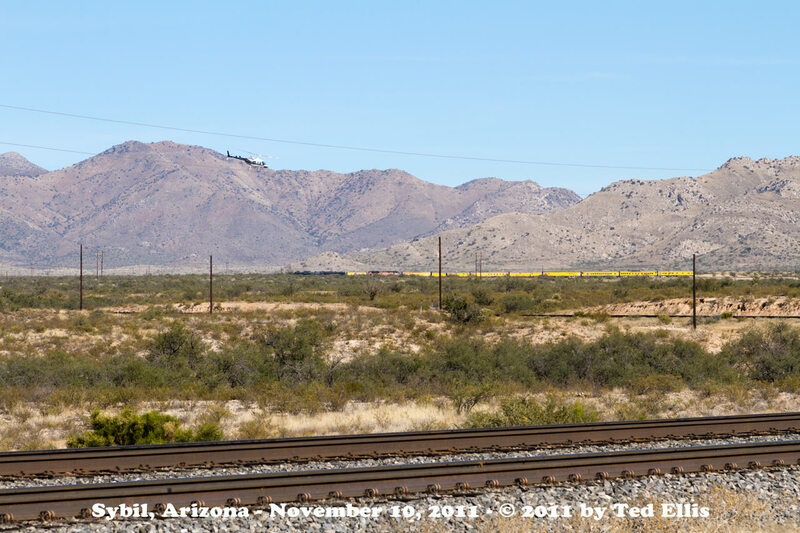 Away the train goes towards Tucson. 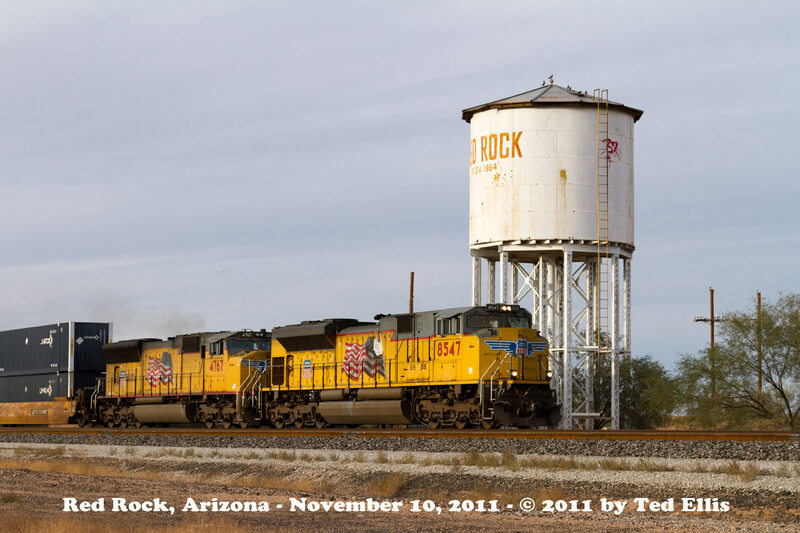 Red Rock AZ - November 10, 2011. 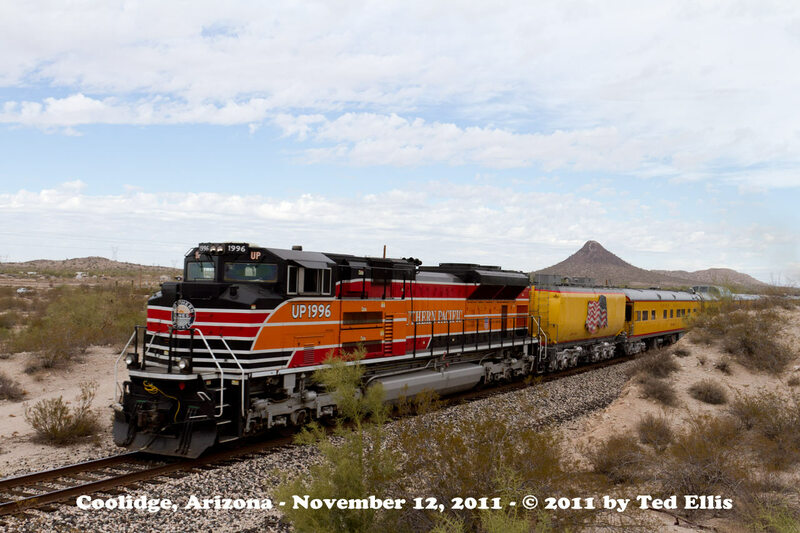 A couple of days later the train headed north toward Phoenix, and here it is just north of the Coolidge Bridge on the Indian Reservation. 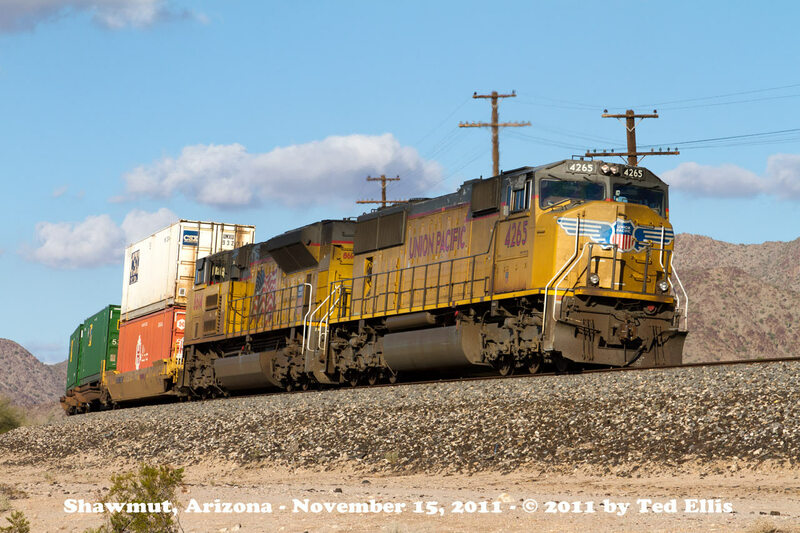 Coolidge AZ - November 12, 2011. One of the few spots I got some cactus in the photo. 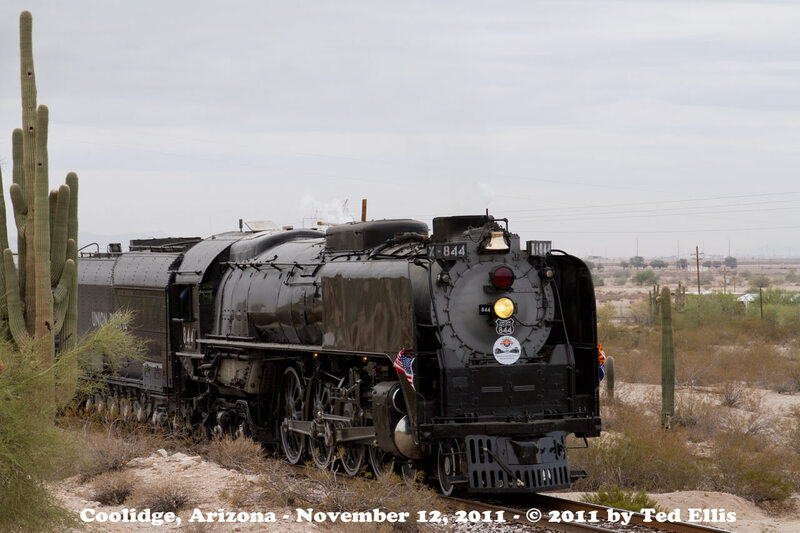 Coolidge AZ - November 12, 2011. Proof that it isn't always sunny in Arizona! Truth be told though, if the sun had been out this photo would have been worse with the back-lighting. 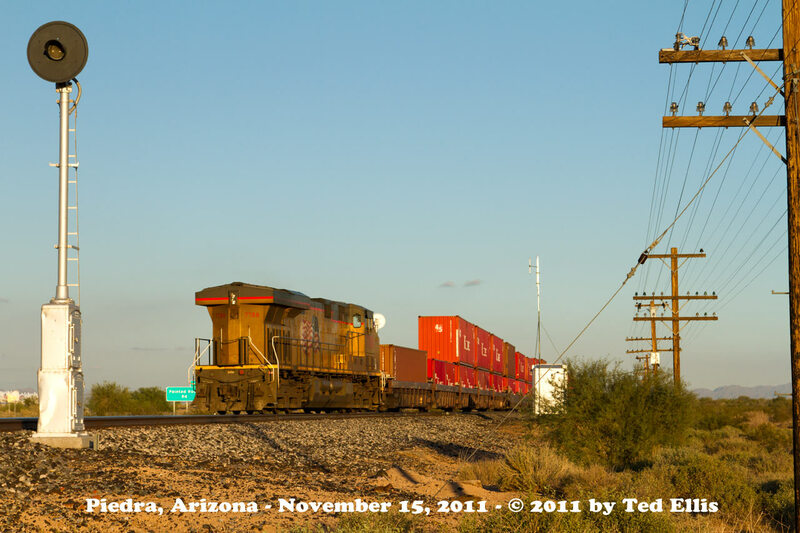 Coolidge AZ - November 12, 2011. 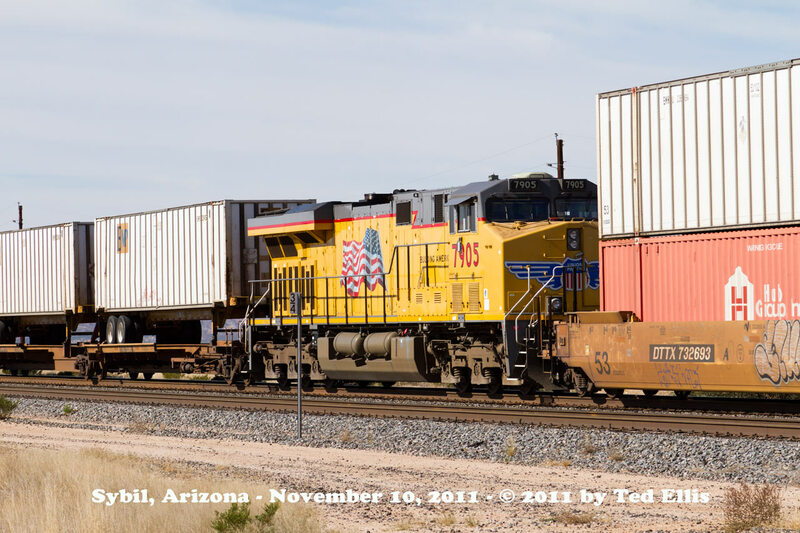 They put the diesel on the tail end for a couple of reasons - weight distribution on the Coolidge Bridge, and so the train could be hauled backwards to Picacho when it left Phoenix. 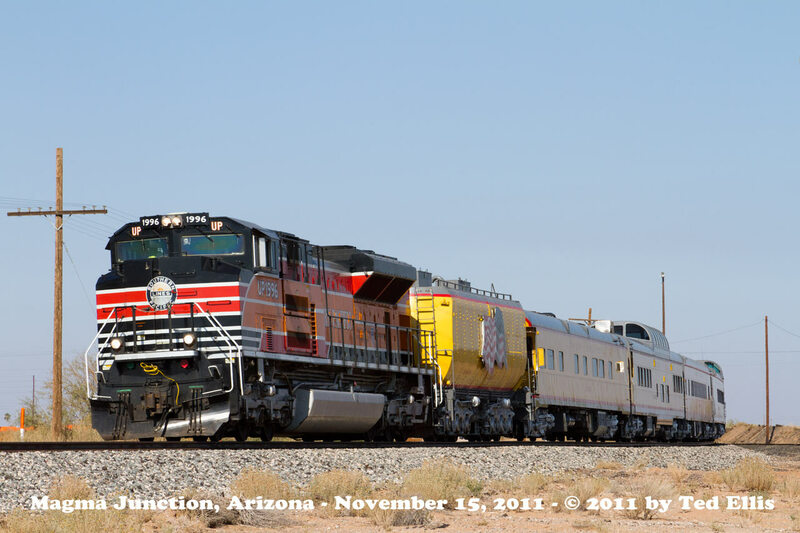 There was some concern about having the 844 go around the west leg of the wye at Picacho account it is a tight curve. 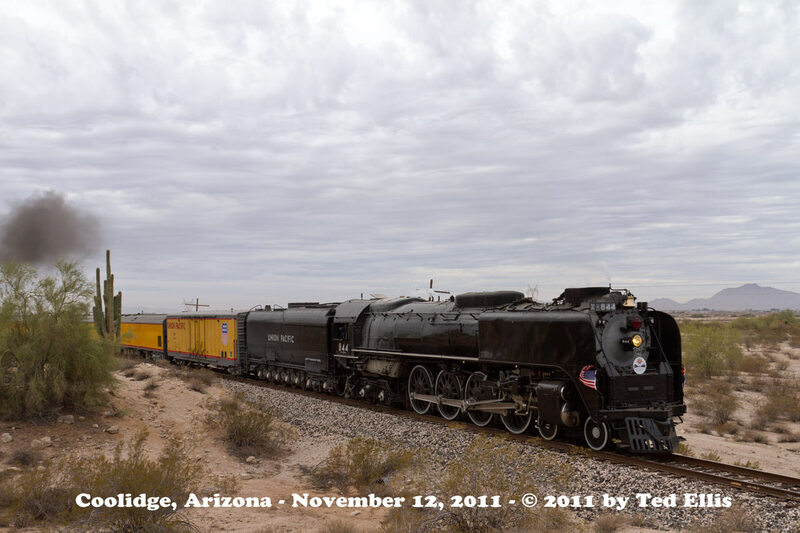 Coolidge AZ - November 12, 2011. 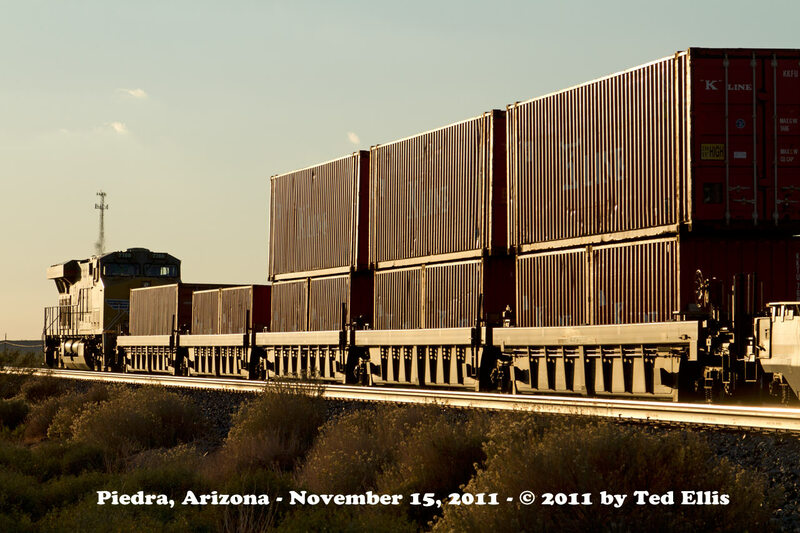 In Mesa the train was creeping along account sharp curves and lots of people near the tracks. 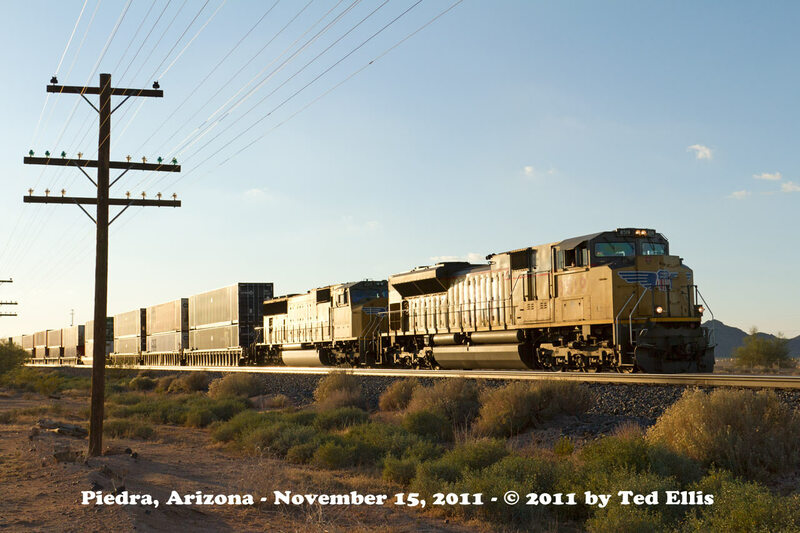 Mesa AZ - November 12, 2011. The track maintainers spread grease on this curve to help the 844 around the corner. 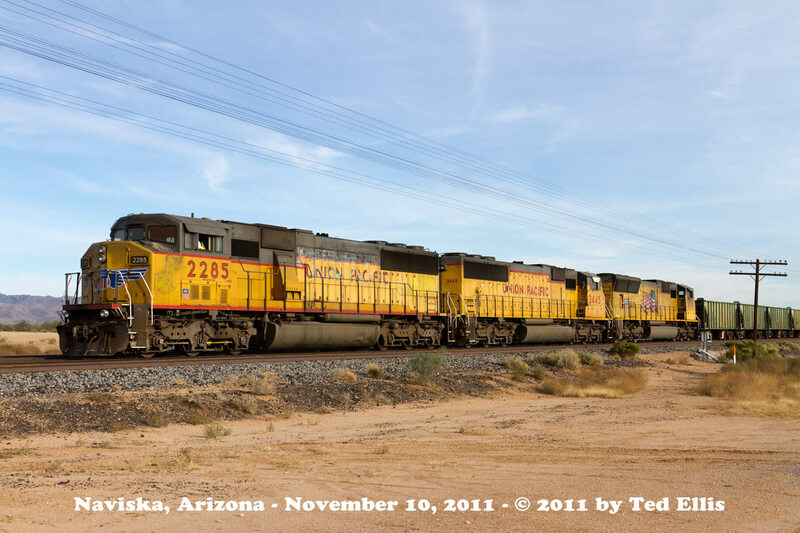 Mesa AZ - November 12, 2011. 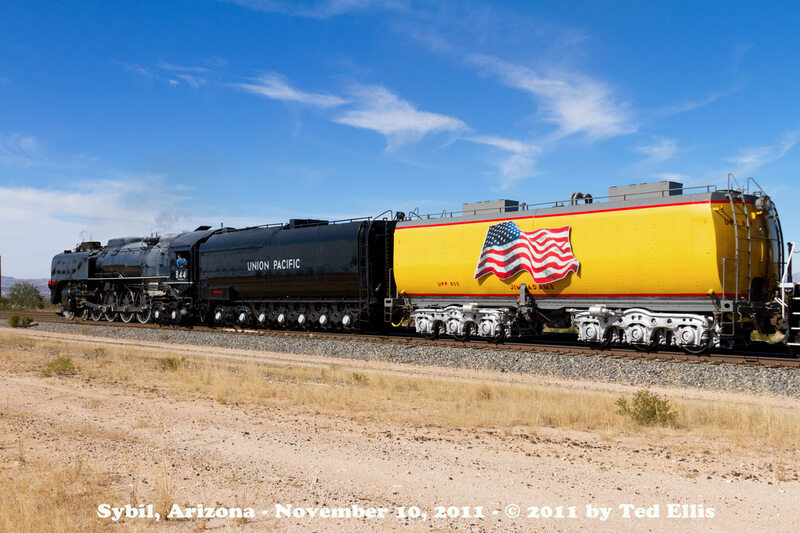 The train was on display in Phoenix for a couple of days. There were a lot of people there looking at it, and even the souvenir car had a lineup of people waiting to get inside and spend money! 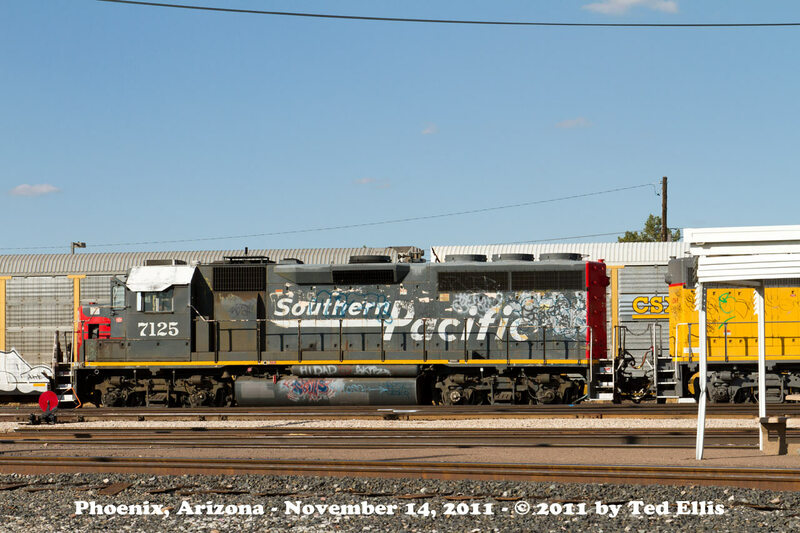 Phoenix AZ - November 14, 2011. 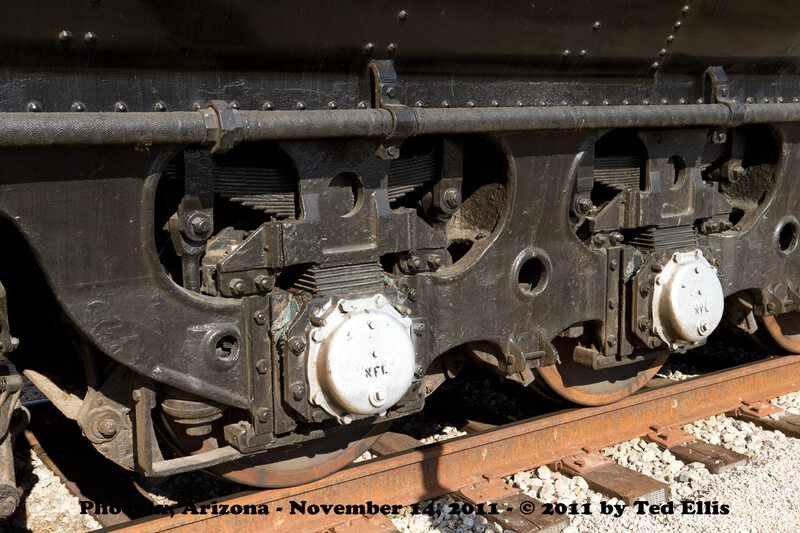 A close up of the 844's tender trucks. 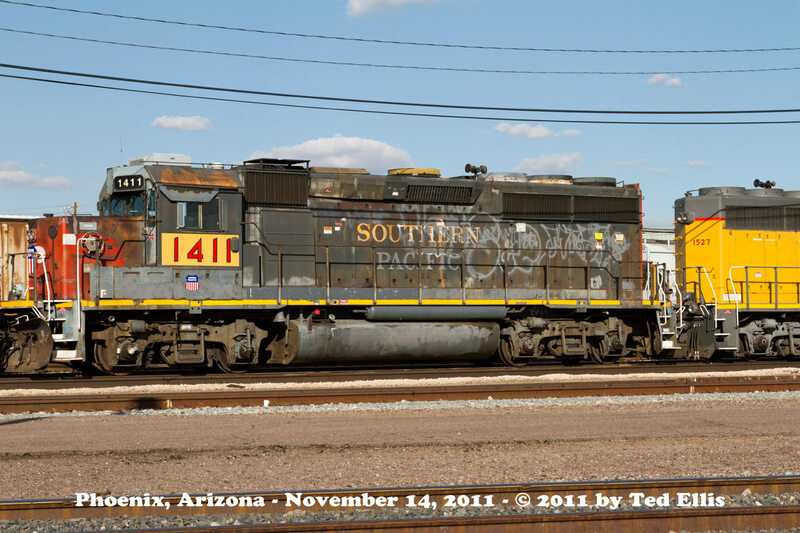 Phoenix AZ - November 14, 2011. The UP certainly used enough cones to keep people away from the unit. 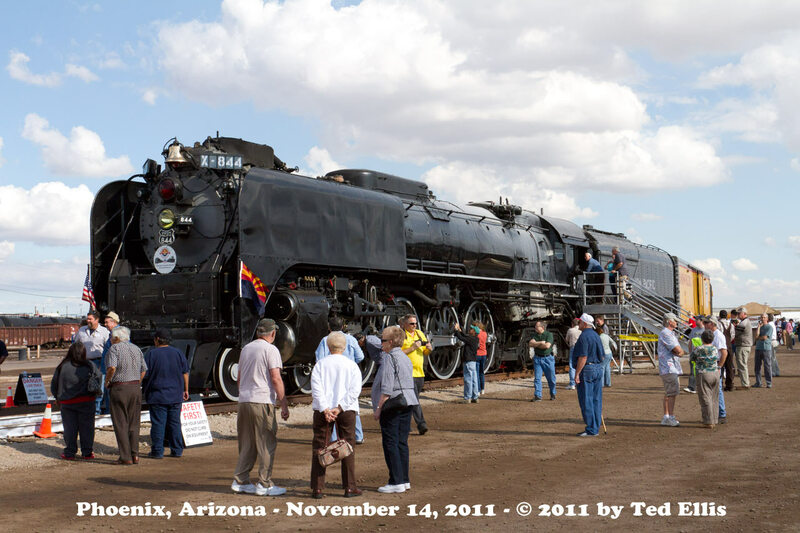 Phoenix AZ - November 14, 2011. And of course I got a couple of shots of other power in the yard. This poor old SP unit sure could use some paint. 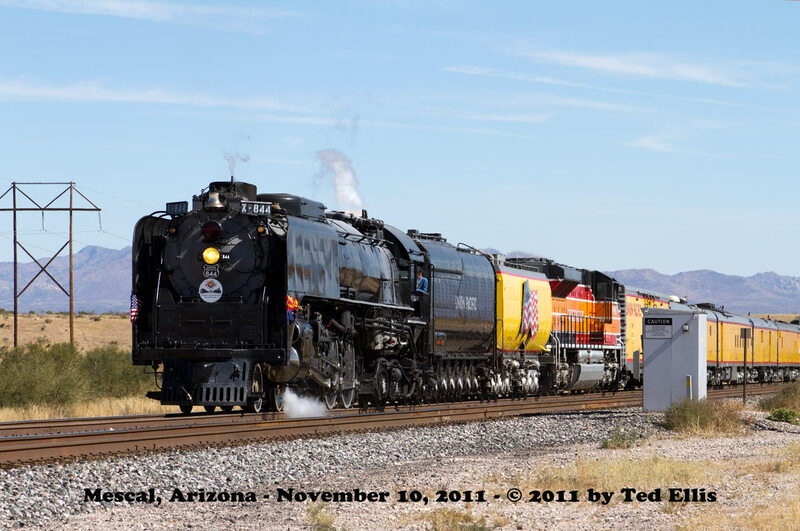 Phoenix AZ - November 14, 2011. The image stabilization feature sure worked well for this shot and the next one below...taken from a moving car as we were leaving the yard. Another SP unit in need of paint. 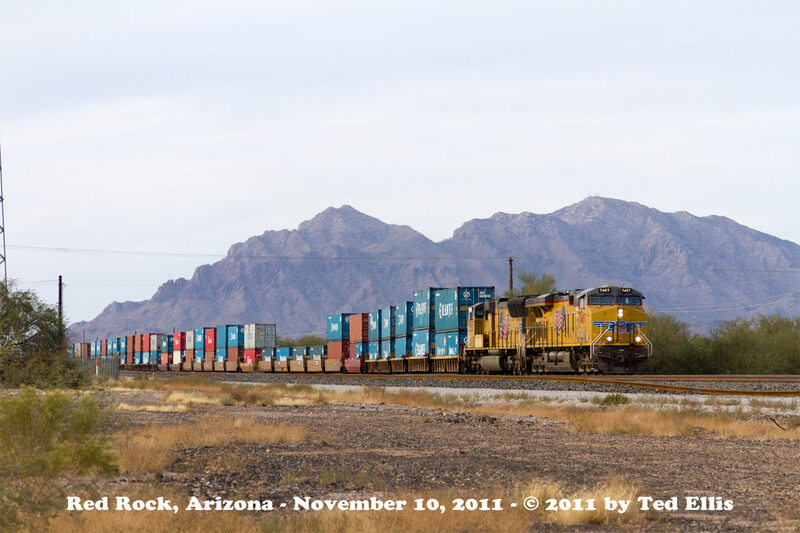 Phoenix AZ - November 14, 2011. 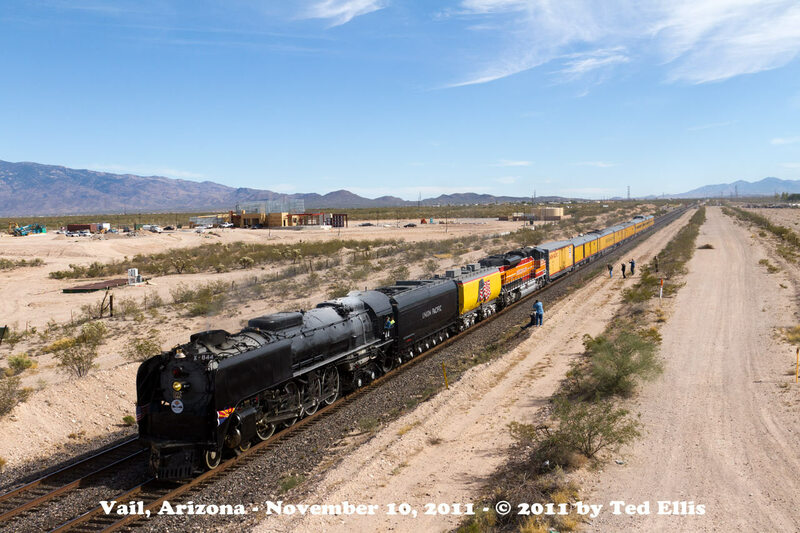 The next morning the train started its westbound trip to Yuma, and here it is passing through Magma Junction. 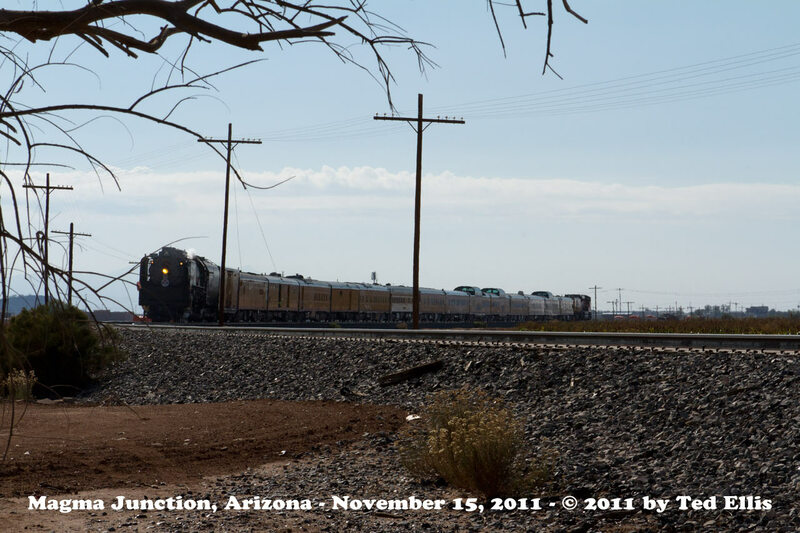 Magma Junction AZ - November 15, 2011. Pulled back on the zoom. 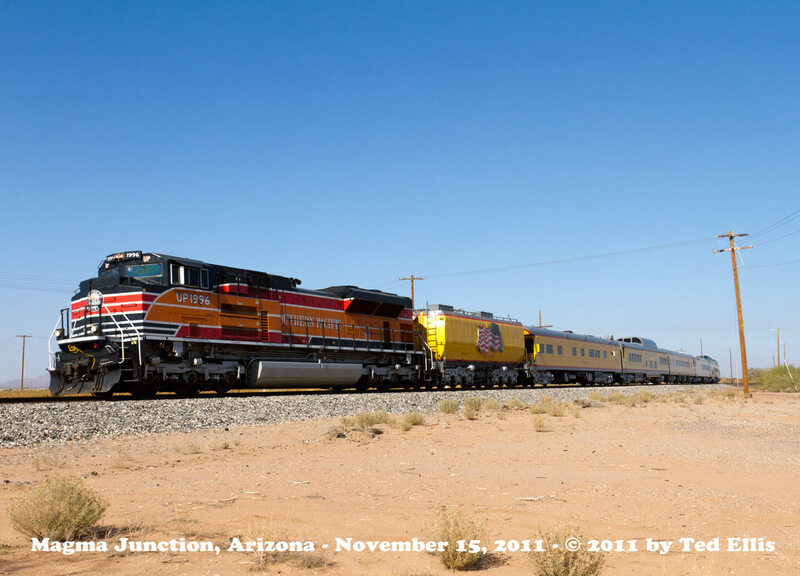 Magma Junction AZ - November 15, 2011. 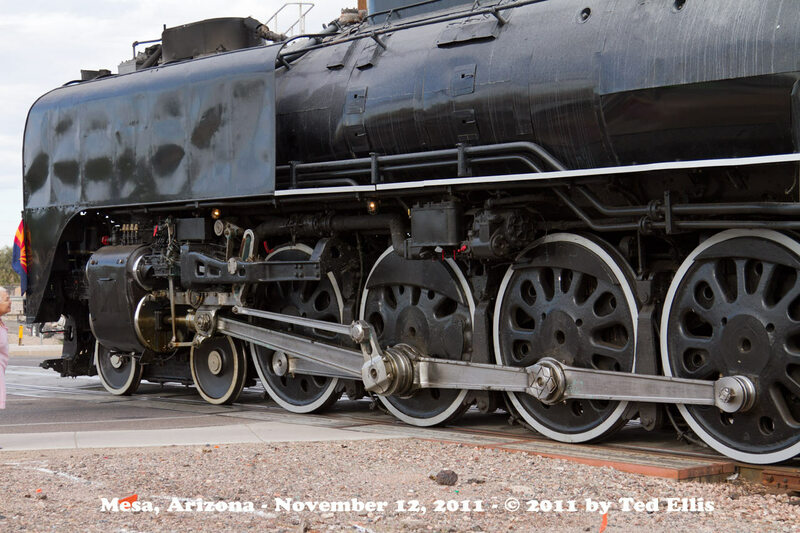 It certainly did not look right seeing the 844 being pulled backwards! 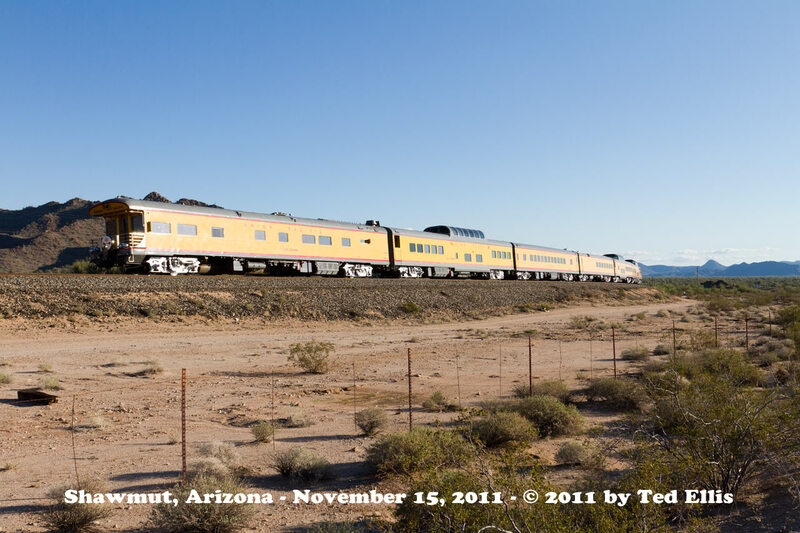 Magma Junction AZ - November 15, 2011. 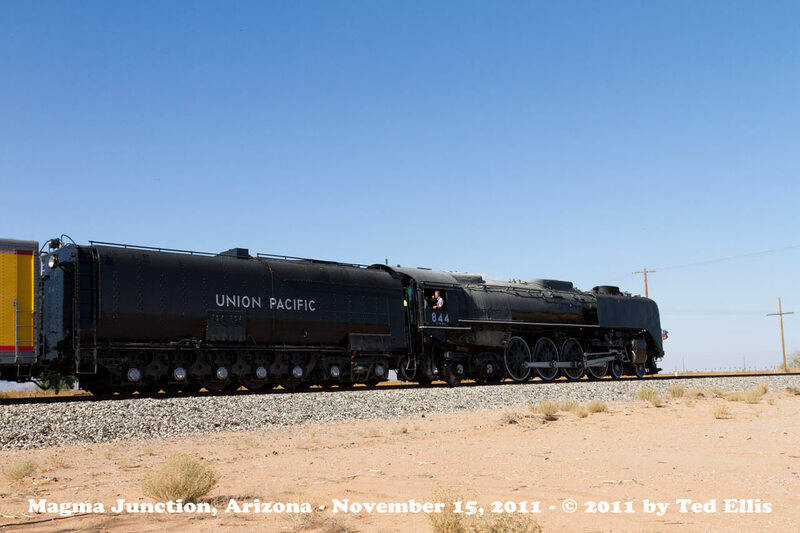 Maybe a new kind of commuter pull-pull train or steam powered DPU!! 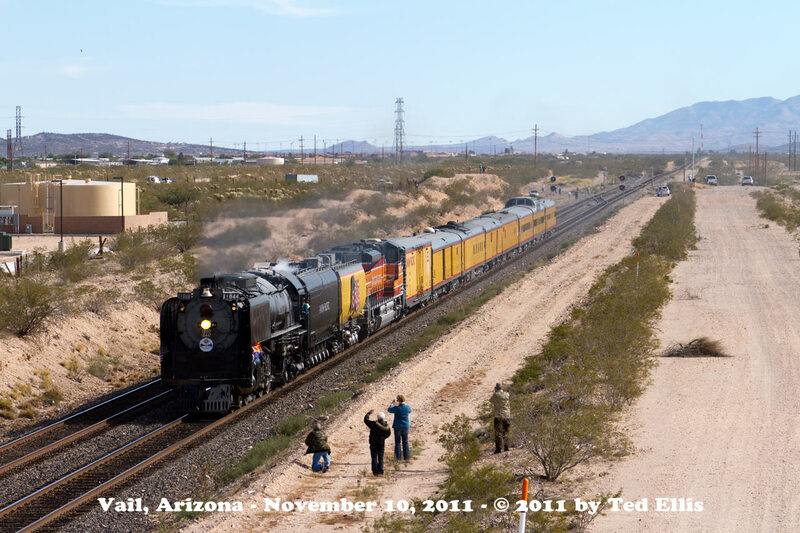 Magma Junction AZ - November 15, 2011. They made a fuel and water stop at Coolidge for about an hour. Most of the town was there to see it. 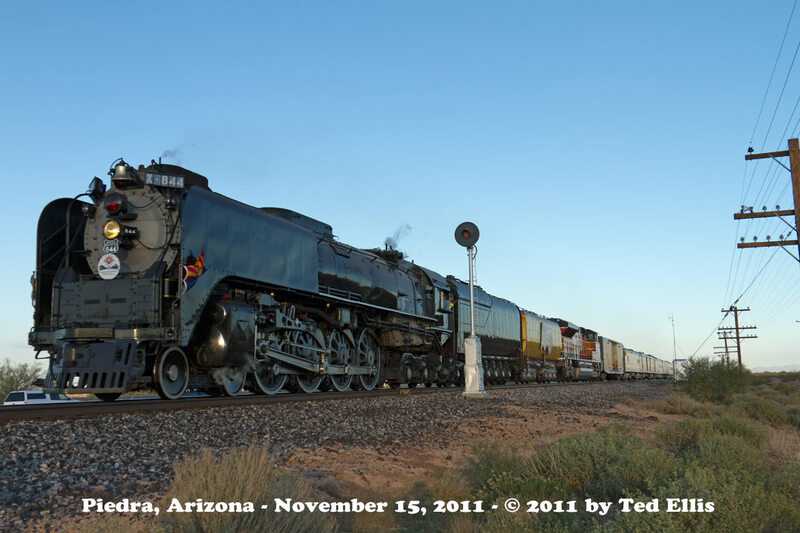 Coolidge AZ - November 15, 2011. And then it was out to Shawmut to see the 844 at one of my favorite places to watch trains. 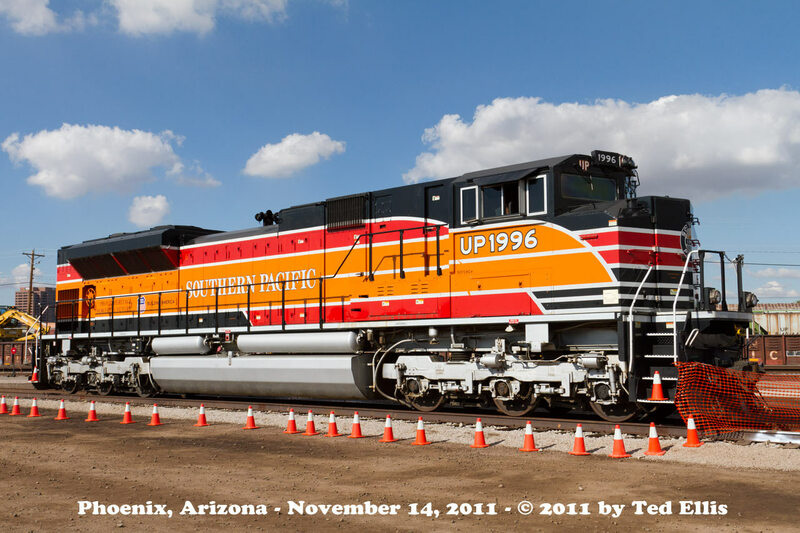 Of course the UP is a great big rolling railroad, and we saw 3 eastbound trains before the 844 showed up. Shawmut AZ - November 15, 2011. Pulled back on the zoom. Shawmut AZ - November 15, 2011. Going away shot of the above train's DPU. 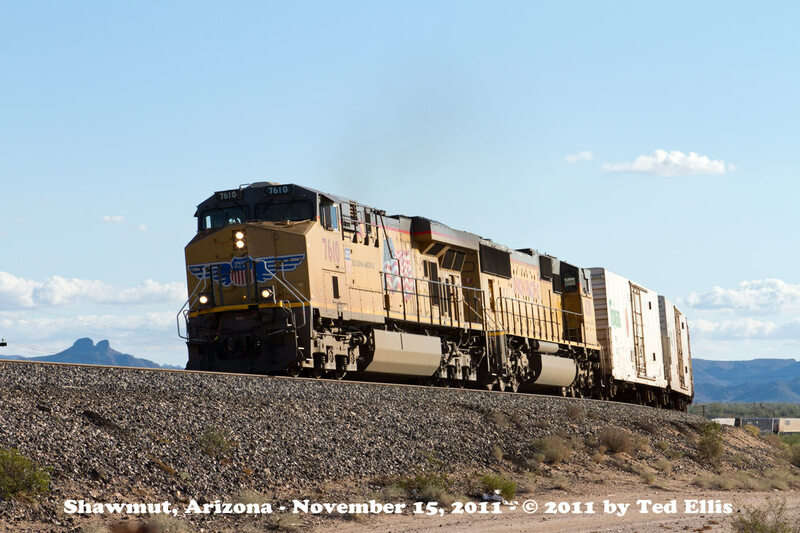 Shawmut AZ - November 15, 2011. Another eastbound. Shawmut AZ - November 15, 2011. Another example of the DPU ahead of the light weight cars. Shawmut AZ - November 15, 2011. The 3rd eastbound train climbing the hill. Shawmut AZ - November 15, 2011. The above train's DPU heading away from us. Shawmut AZ - November 15, 2011. And here she comes! The 844 rounds the curve into the golden afternoon sun. Shawmut AZ - November 15, 2011. Sure looks nice in the golden light. 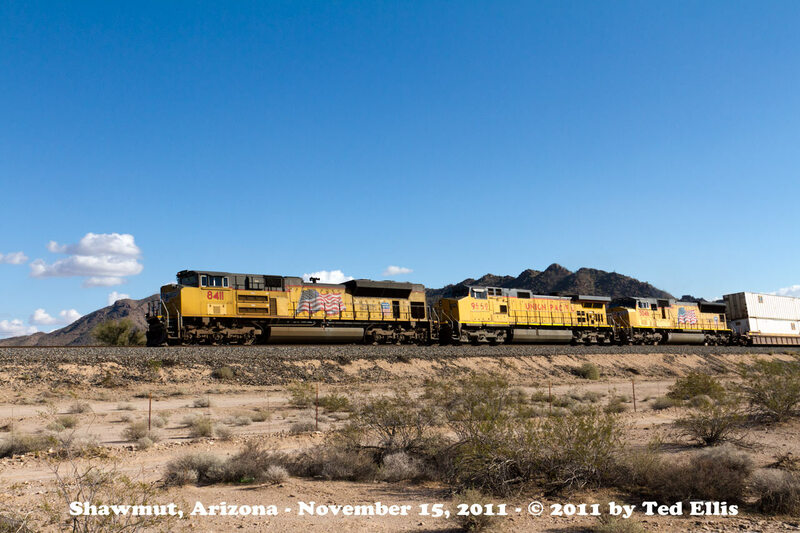 Shawmut AZ - November 15, 2011. Headed off to the west. Shawmut AZ - November 15, 2011. This sure would be a nice train to ride! 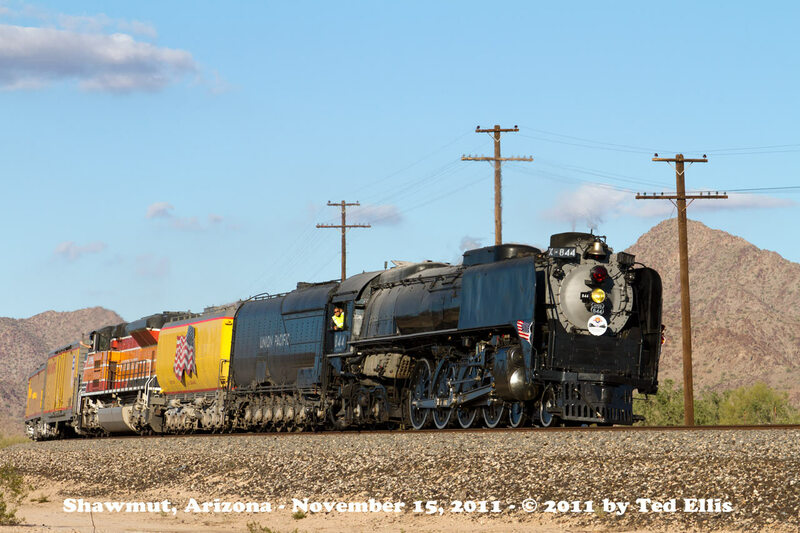 Shawmut AZ - November 15, 2011. 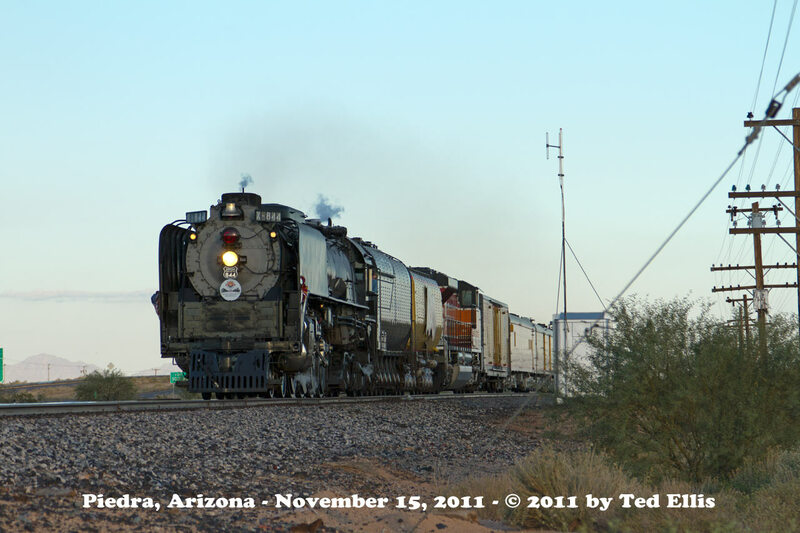 One last runby of the 844 at Piedra (just west of Gila Bend). Piedra AZ - November 15, 2011. Even though the sun went under one of the few clouds in the area, I was able to enhance the image with Photoshop. Piedra AZ - November 15, 2011. 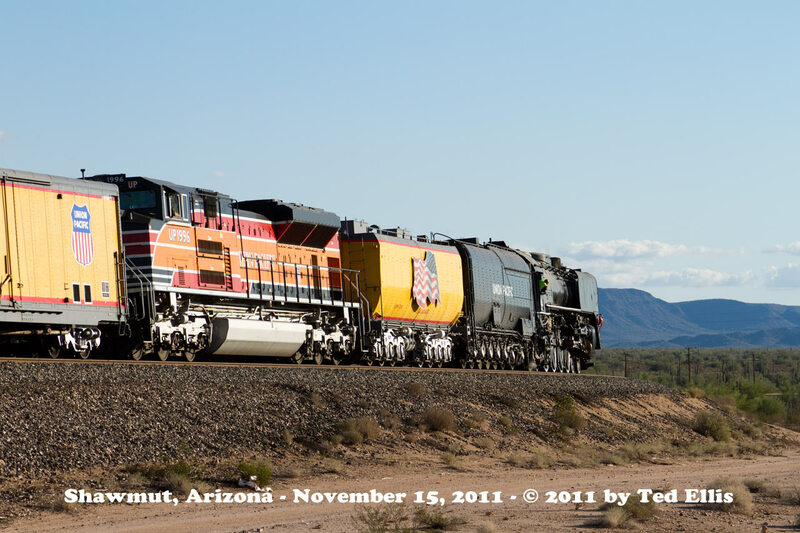 There was an eastbound freight in the hole here at Piedra, and here he is just getting underway after the 844 passed by. Piedra AZ - November 15, 2011. The DPU in a 'glint' shot. Piedra AZ - November 15, 2011. The eastbound is just about all on the main. Note the pole line and searchlight signal...both are likely to disappear soon with the on-going double tracking work going on. Piedra AZ - November 15, 2011. Here is a shot of the sign on the side of the baggage car. 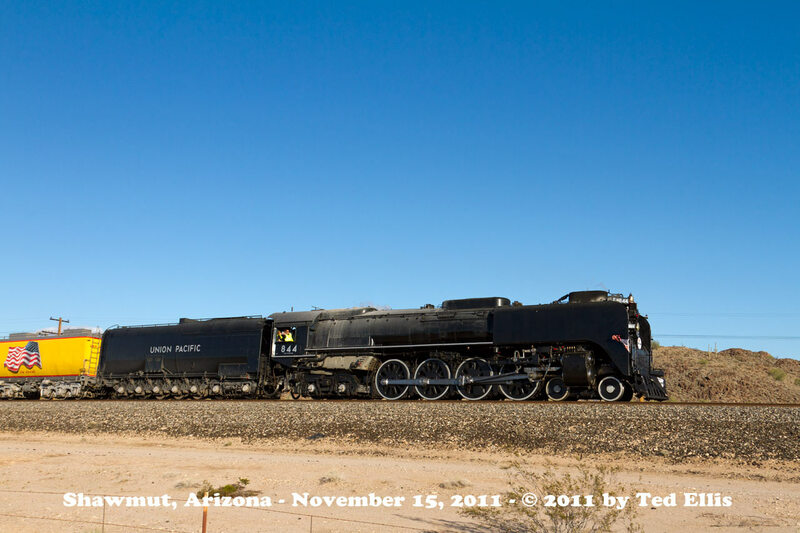 Taken at Phoenix November 14. Hope you enjoyed these photos! This Web Page and all photos on it copyright © 2011 by Ted Ellis. All Rights Reserved.